Are you looking for some great sports book to read on your next away game trip? Rather something historical or something funny? Well, here you go. 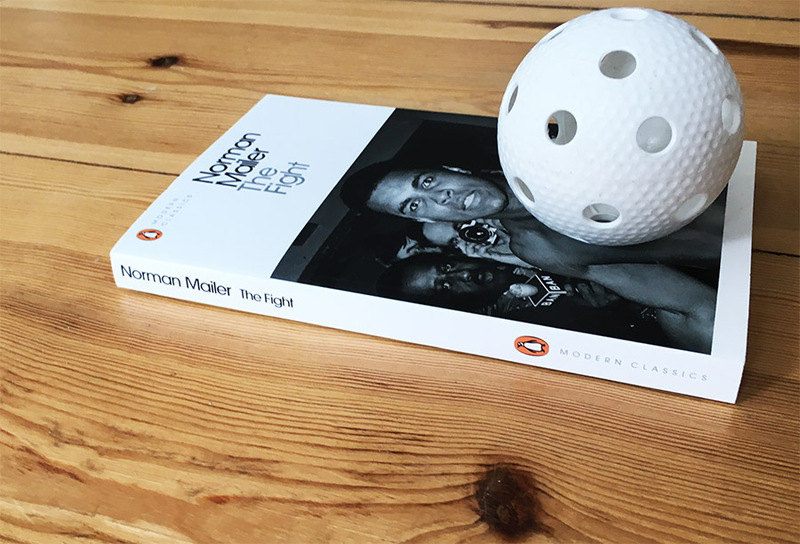 We sat down and prepared a selection of the finest sports literature for floorball players. Have a nice read! Why to read: There are plenty of books about Mohammed Ali’s epic life. But Norman Mailer’s “The Fight” about the legendary duel between Ali and Foreman in Kinshasa 1974, known as the “Rumble In The Jungle”, is playing another league. “One of the defining texts of sports journalism. Not only does Mailer recall the violent combat with a scholar’s eye […] he also makes the whole act of reporting seem as exciting as what’s occurring in the ring”, wrote GQ. Why to read: The subtitle: “The Unknown Story of Football’s True Talent Spotters”. In fact, this books offers you an unexpected view on the pathetic and touching routines of english scouts, “everywhere yet nowhere, faceless and nameless”. Award-winning sportswriter Michael Calvin opens a hidden world that will drag you in and won’t let you go that easily. Why to read: The Jamaican fast track high school championships are being watched by 35.000 screaming fans. Of the 10 fastest 100-meter times in history, 8 are being held by Jamaicans. Richard Moore explores what makes this little island a sprinting powerhouse and reveals the secrets of the Jamaican sprint factory. By the way, if you want to get more personal, you might enjoy Bolt’s autobiography Faster than Lightning, too. Why to read: You don’t have to be the biggest admirer of Nick Hornby to appreciate this award-winning book. An ingenious combination of documentary, memoir and comedy. Fever pitch will drown you in agony and ecstasy of passionate fandom. And it will teach you, how beautiful losing can be. Why to read: Perhaps you know the acclaimed movie with Brad Pitt. But this story is far more interesting than a 90 minute film can ever be. Lewis tells the fantastic story of Oakland Athletics’ general manger Billy Beane. This larger-than-life figure totally twisted the rules of player analysis and changed baseball forever. “The single most influential baseball book ever”, writes Slate. “May be the best book ever written on business”, adds Weekly Standard. Why to read: The genius of Andrea Pirlo is an undeniable historical fact. The Italian was to football, what Botticelli was to painting. But all great wins, directed by his beautiful passes, are directly connected to wonderful insider stories about greats such as Maldini, Shevchenko, Ancelotti, Conte Seedorf, Buffon, Lippi, Kaka, Nesta or Gattuso. A must-read for every footballer. Why to read: Most likely the best hockey book ever written. Ken Dryden, the former Montreal Canadiens goalie and former president of the Toronto Maple Leafs, cuts deep into the heart of hockey and portraits of famous characters such as Guy Lafleru, Guy Lapointe and Scotty Bowman and takes us behind the scenes of the perhaps greatest team in hockey history – the 1970s Montreal Canadiens. Why to read: A #1 New York Times bestseller and Sports Illustrated’s best football book of all time. Bissinger’s “Friday Night Lights” tells the story of the Permian Panthers of Odessa, a struggling, socially and racially divided high-school team. An inspirational book explaining, what “perfection” really means. Why to read: Buford’s ingenious work about hooligan culture is a masterpiece. Barmy Bernie, Daft Donald, and Steamin’ Sammy like beer, football and the Queen. The rest can rot in hell. A timeless study Newsweek called “one of the most unnerving books you’ll ever read”. Why to read: In 1970 Ball Four was a scandal. MLB commissioner Bowie Kuhn even tried to force the author to sign a statement saying that the book was fictional. Former New York Yankee pitcher Jim Boulton documents in his diary his season with the unlucky Seattle Pilots and (after a trade) with the Houston Astros. To the readers he provided a unique view into the sinful business of professional baseball – drugs, cheating and violence. Why to read: The claim already says a lot: “A Hidden Tribe, Superathletes, And The Greatest Race The World Has Never Seen”. Yes, we all hate the pre-season. All those runs, fast and slow, up and down the hill. But Christopher McDougall’s legendary masterpiece “Born To Run” will show you a different perspective and you will love it. Why to read: The story about a crooked-legged race-horse, that became one of the most electrifying and popular attractions in sports history and the biggest American newsmaker in the late 1930’s. Perhaps you’ve heard of it, perhaps you’ve seen the move. Anyways, read the book. Why to read: As a little extra we have a business book for you, too. But “Shoe Dog” by Phil Knight, the visionary, eccentric and solitary founder of Nike, is actually much more than that. It’s a memoir covering the incredible evolution of a little backyard company into a multi-billion corporation, into the most valuable and most powerful sports brand on this planet. Just read it.